Julie Fisher (American Philosophical Society and consulting editor on the Northeast Native Portal – formerly the Yale Indian Papers Project) led us through our first-ever Transcribathon on Saturday, March 23. 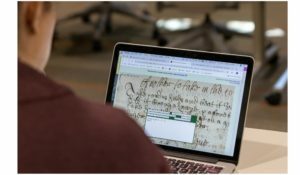 With her help, twenty volunteers decoded and transcribed 17th century documents via the Folger Institute’s DROMIO site. No experience was necessary to attend the event. We hope to hold more such events in the future. Please watch this website for more details.